Stress fractures were first described in 1855 by a Prussian military physician who observed foot pain and swelling in young military recruits. He called the condition “Fussgeschwulst”. I don’t know what the exact translation of this is, but it doesn’t sound good. As stress fractures can translate to missed training and even a missed season for the runner, I recognize that the words “stress fracture” herald disappointment in the clinic. Early diagnosis and proper management will hasten the return to full training. A stress fracture is the end result of the failure of bone to respond adequately to mechanical loads (ground reaction forces and muscle activity) experienced during exercise. Bone responds to strain by increasing rate of remodeling. In this process, bone cells called osteoclasts resorb bone, which is later replaced by even denser bone by bone cells called osteoblasts. Since there is a lag between the onset of bone resorption and bone production, bone is weakened during this time. If sufficient recovery time is allowed, bone mass eventually increases. If loading continues, however, microdamage can occur, eventually leading to a stress fracture. Simply put, stress fractures occur when we train too hard without adequate recovery. In most studies of collegiate athletes, track and field accounted for more stress fractures than any other sport. In runners in general, the most common site appears to be the tibia (lower leg), followed by the metatarsals, navicular, and fibula. In track and field athletes specifically, however, navicular stress fractures predominate. Stress fractures occur most commonly when the runner has experienced a transition in training. Common examples include increasing mileage too quickly and changing a phase of training to more intense training. The use of spikes during training has been proposed as a potential risk factor, but this has not been definitively proven. I see a lot of stress fractures in first time marathoners. Although many good programs for training for a first marathon with relatively low mileage exist, the constant increase in training is a challenge, especially when the long run distance exceeds the amount of running done during the remainder of the week. The runner with a stress fracture may experience only minimal symptoms early on. For example, one may feel a mild ache in the shins or on the top of the foot only after one’s long weekend run. As time goes on, however, the pain becomes more noticeable and occurs sooner. Pain is usually worst during or soon after a run. Rarely does pain associated with a stress fracture improve with running. One can usually identify a particular point which is most tender to touch. Since many stress fractures do not appear on xrays, a more sensitive test such as a bone scan or MRI may be needed to confirm the diagnosis. Stress fractures may be classified as either non-critical or critical. Non-critical stress fractures include the medial tibia, most metatarsals, and femoral shaft. Medial tibial stress fractures cause pain on the inside of the shin and are often difficult to distinguish from shin splints. Point tenderness and progressive worsening while running are clues that may help distinguish a stress fracture from shin splints. Metatarsal stress fractures usually cause pain on the top of the foot, just above the toes. Femoral shaft stress fractures cause pain in the thigh, and are often diagnosed as a quad strain. The lack of a specific injury, however, should raise the suspicion for a stress fracture. Most non-critical stress fractures will heal with 4-6 weeks of rest (no running). For the medial tibia and metatarsal stress fractures, I will often prescribe a walking boot for a few weeks as in general this makes walking more comfortable and my experience is that runners typically get back to full training sooner if we take this more conservative step early on. 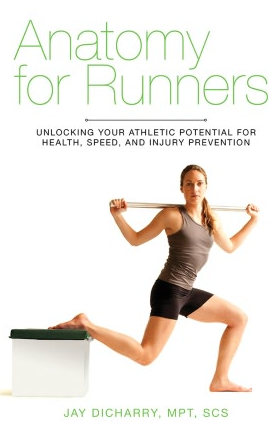 During this time the runner may remove the boot for sleeping, showering, driving, and cross-training. I prefer deep water running, but the elliptical and bike are good choices, too. Try to pattern your cross training workouts to replicate what you would normally do on land. The return to run program commences after 4-6 weeks and progresses gradually. I often start the runners on a walk/jog program where they walk a minute/jog a minute for a couple weeks before they begin regular running. 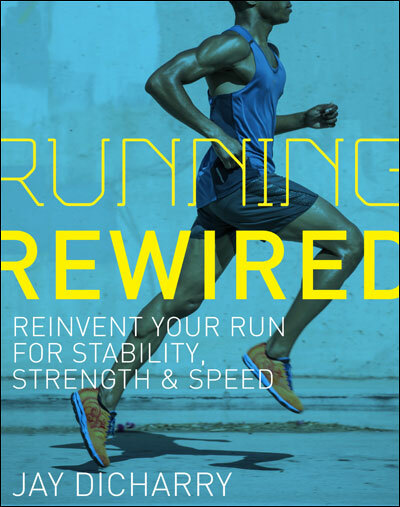 During the transition back to full training, cross training supplements the progressive run training. Critical stress fractures are those that require special attention as they either require an extended time to heal or require limitations on weightbearing. They also carry risk of incomplete healing which could require surgical intervention if not addressed early. Critical stress fractures include the femoral neck, anterior tibia, medial malleolus, navicular, and 5th metatarsal. Femoral neck stress fractures present most commonly as groin pain, very similar to a muscle strain. Stress fractures, however, occur after repetitive activity and there is rarely a history of one particular “strain”. Anterior tibia stress fractures cause pain on the front of the shin. Medial malleolus stress fractures cause pain on the bone on the inside of the ankle. Navicular stress fractures usually cause pain on the top of the foot just in front of the ankle, extending into the midfoot. 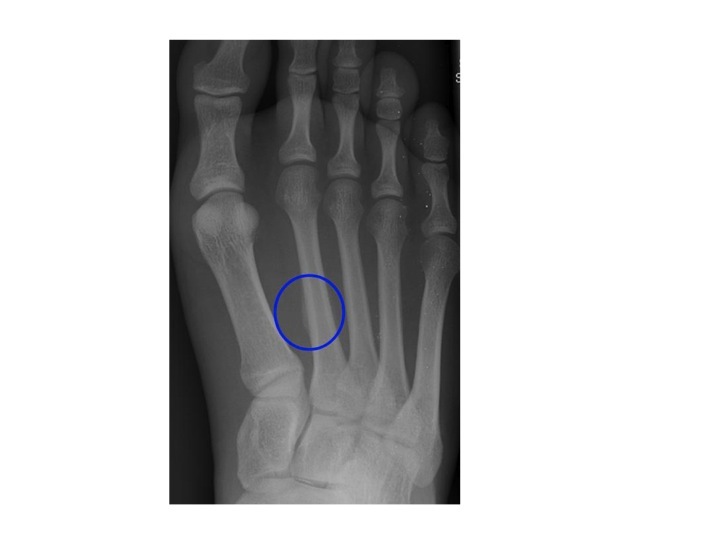 5th metatarsal stress fractures cause pain on the proximal aspect of the 5th metatarsal on the outside of the foot. These stress fractures require special measures beyond a simple period of rest (i.e. crutches, casting, or bracing) and therefore pain in these regions should be evaluated sooner than later. If we can identify these before a fracture line develops, healing is usually uneventful. If a true fracture line develops, healing can become more challenging. Fortunately for runners, most stress fractures are non-critical and will heal without complications. A high level of suspicion should be maintained when experiencing pain in the areas described for the critical stress fractures, especially if one has been increasing the volume or intensity of one’s training. If a few days of rest, ice, and cross training don’t eliminate the symptoms or if one is having pain with walking and other daily activities, evaluation is indicated. If you do experience a stress fracture, be sure to discuss appropriate cross training guidelines with your physician, as in most cases cross training can preserve a critical level of fitness as you recover. This entry was posted in rehab, running, Uncategorized and tagged rehab, running, shin splints, stress fracture, treatment on June 17, 2010 by an athlete's body. Wow, a lot of great information there! You obviously did a lot of research for this story. Even though I have been diagnosed with FOUR! stress fractures by the UVA Running Clinic and am battling extreme sadness, I must say Dr. Statuta and co. has been the absolute best physician I have ever seen in this state. Not only did she empathize with me when I was told I couldn’t run my first Boston Marathon, but she followed through with personal phone calls of encouragement and sympathy. After seeing several doctors in my local area for what I thought (and was told) was tendonitis, Dr. Statuta nailed in with one appointment. The clinic was thorough with identifying the problem and continues to care for their patient even through healing. If you are in the state of VA and suffer from some sort of running ailment (shoot, I would even pay the money to fly to this place! ), the UVA Running Clinic is the place to go. amazing information helped me outalot. Im going to need a walking boot and crutches real soon in order to heal.